We have a long history more than 20 years in developing and designing the Optical Disc Drives (ODD) from CD/DVD play only drive to Blu-ray Disc Drive (BD). Extending the drive designing, we have produced variour ODD relating inspection devices. The advancement of the information-technology industry is remarkable in recent years, its speed increases without limit, the surrounding environment is advanced in rapid progress, and the possibility has extended infinitely. According to the treated information being expanded and audio/video data is digitalized, the optical disc as the recording medium bears the prominent role on both sides of industrial use and household use. Our experienced manufacturing engineering experts will provide our customers with a start-up of the production line and consistent support including the worker's training and guidance. General developmet and design of ODD（CD－ROM、CD－R/RW、DVD－ROM/R/RW） in terms of electric circuit, firmware, and software including interface and write strategy. 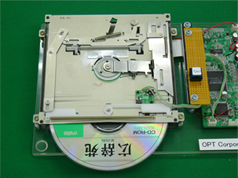 Development and design of Slim (12.7 mm) loading mecha and Slot-in mecha for DVD－ROM Drive. Development and design of Blu-ray Disc (BD) drive and Player.